Another Detroit obscurity No More Tears features a heart wrenching vocal from Mr Ross who gives his own lyric a fine work out. I love his bursts into falsetto which contrast so well with his normal gritty baritone. Arranger Paul Riser throws the kitchen sink at the background instrumentation and the tenor sax which weaves in and out of the verses is particularly fine. I don’t know of any further discs by Herbie Ross or indeed any more on the Hunza label. More info on either topic would be welcome. "Herbie Ross and the Hunza label were both from Toledo, Ohio. Ross was popular in Detroit, as many Toledo artists were, so he's often called a Detroit artist in error. 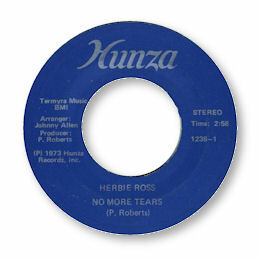 There is one more record on Hunza that I know, another version of "No More Tears." Hunza 1237 Charles Moore “My Heart Skipped A Beat/ No More Tears”. Thanks to Andy Aitchison for the suggestion and to Dante Carfagna for all the extra info.